Greg's Moscow Adventure Photos: Fly a MiG Over Moscow with Incredible Adventures! Life is either an Incredible Adventure. . . or nothing at all! 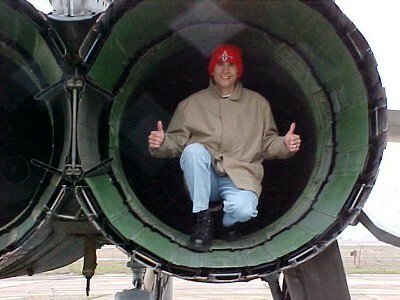 I'm kneeling in the afterburner of the MiG-25. The massive afterburners produce almost 30,000 lb of thrust and can take the plane up to Mach 3+ and over 80,000 feet high where the sky is black above and blue below. Wow!